What is your specialty? Everything from helping you to redesign your current forever home to helping you find a diamond in the rough in your ideal location. And doing the design/reconstruction of what is to be your forever home, for you. Do you do new construction? Yes! We work with a local builder that can build your new home from $300,000.00 to $1,000,000.00 and up. We can help design your blueprint and even help in choosing furnishings and in the moving process too! Do you work with realtors? Of course! We are happy to help facilitate any part of the process. 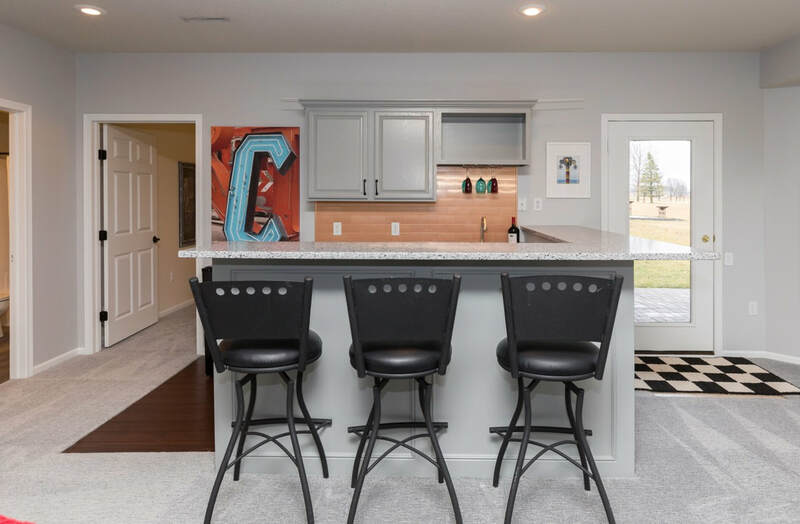 Whether it is staging or redesigning a home you have listed for sale (98% of our homes sell in less than 30 days and many with in a day or two) or realtors clients who find a home they love, in the perfect location but is out of date and needs updates. We can show them how it can be their dream home and give them estimates for renovation and design costs in advance of making an offer. How long have you been doing this? Over 20 years! How do you choose your layout/blueprint for each home you do? In every house we renovate, we consider it one we would want to live in. We carefully weigh layout, functionality, usability and entertaining aspects. These are all important elements of a highly workable living space with comfortable, warm touches. Okay, so what about costs? You might be surprised that having a beautiful home doesn’t always have to be expensive. We are happy to come into your existing home and consult with you and learn your goals for your home. Whether its to reorganize, declutter, restyle or sourcing a few statement pieces for a very affordable price, we are confident we can help you achieve your goals and enhance the way your entire home feels. 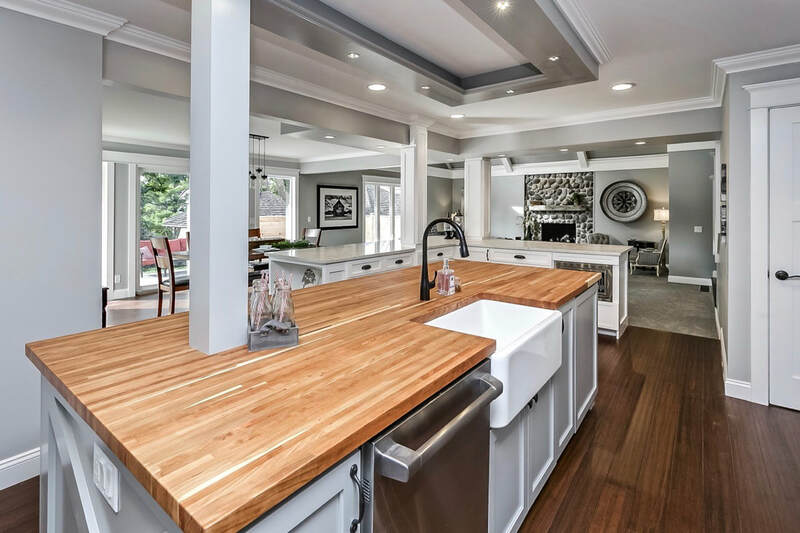 Construction estimates on remodels can be all over the board. Our goal and desire is to clearly understand your needs, your vision and give you an accurate estimate before any renovations begin. Do you sell the furnishings with your renovated homes? Yes! In fact, many of our buyers want to keep the feeling of the home as they saw it the first time or choose to select certain pieces, or entire rooms of our home furnishings and décor. Our showroom will give you more choices and Angela is happy to source furnishings for you as well. Will you source furnishings and décor? Yes! Many clients just want a fresh look and a few new pieces and accent décor. We have a solid list of resources that make it easy for us to find the perfect pieces for your home. What do you offer in your Mercantile and Design Showroom? Our Design Showroom and Mercantile serves multiple purposes. 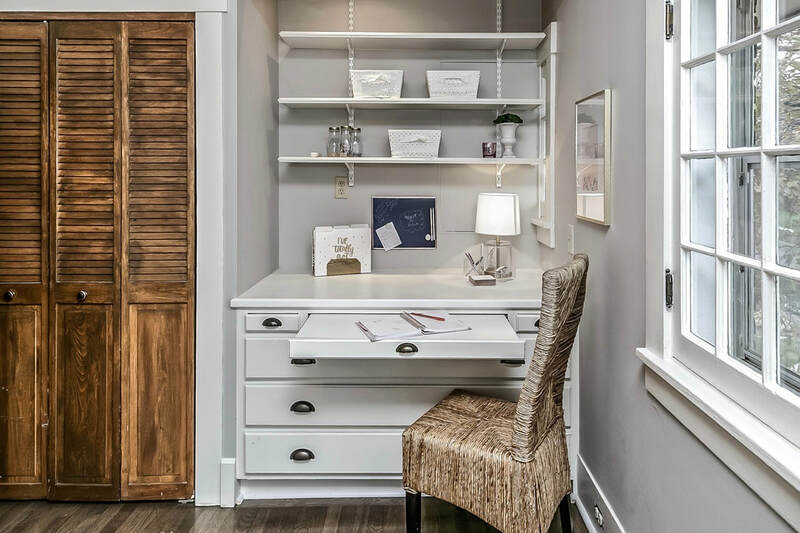 Our design showroom allows you to see some of our previously renovated homes showcased on our gallery wall, as well as look books for you to peruse. We also create ever changing vignettes all available for sale. As you explore Mercantile, take a moment to check out the newly renovated bathrooms which include some of our signature finishes. You will notice that our showroom is a mix of high end new furnishings, custom built wood and metal pieces, and repurposed, genuine vintage finds transformed into functional, funky gems. In addition, we have created a cozy environment to enjoy a cup of free Black Rifle coffee, while you visit with friends, business partners or need a change of scenery as someone who works from home. Groups often gather for casual coffee chats, companies use our space for meetings, friends gather to catch up and parents even stop by and relax while their kids play in the park. We offer a unique selection of gifts, apparel, and home décor. Through select and unique companies and the talents of local artists and some of our own signature creations we have a variety of gifts for all your needs. We are proud to carry the largest selection of all things ADM…GO TIGERS, a casual women’s line and quirky/fun T’s for men and women! Need a custom order for your sports or work team? Maybe a family reunion? We take custom apparel orders too. And if that isn’t enough to prompt you to stop in, we are constantly adding bridal and baby gifts and are working on creating registries for both. Looking for something specific? Call us! If we can’t create it, we can find a resource who will, or know the talent who can create it. Will you do custom home furnishings? Absolutely! We are proud to work with some talented artists and tradesmen to create anything from art and décor to farm tables, bedroom sets, accent tables in a variety of metals and woods. We promise you will love them and they will be uniquely yours? What is your design style? Great question. Angela has a diverse style depending on the feel of the home and of course the needs of the client. We have done small 2 bedroom bungalows, large (8500 sq. ft.) mid century modern homes, modern farm houses and almost everything in between. The key to building or remodeling is communication. We will be with you every step of the way to make sure we understand what YOU want! Executing YOUR dream, that's our style… and if you don’t know what your style is, we will offer suggestions and ideas to help you make your decisions.